â€œImagine if you could board a train at least every 30 minutes in urban regions, or every 60 minutes at any station in the rest of the state, and travel seamlessly to any city in California? Instead of stapling together sets of projects from around the state and calling it a plan, the California State Transportation Agency is taking a new approach – a vision and set of strategies to create a convenient transportation network, backed by the money and power of the state of California, using effective practices from around the world. Creating an integrated network could greatly increase ridership – the State Rail Plan envisions intercity passenger ridership multiplying more than tenfold from 115,000 trips per day today to to 1.3 million trips per day. The Caltrain Corridor, as the West Bay spine slated to share tracks with High Speed Rail service, is seen as a critical piece of the network. As such the Caltrain Network is on deck for major investments to improve capacity and coordination. Read on for opportunities posed by the State Rail Plan to bring major improvements to the Caltrain corridor, and thoughts about comments and improvement. The comment deadline for the State Rail Plan is December 11. There is one Bay Area public meeting on Wednesday November 1 in Oakland, at 1721 Broadway from 4:30 to 7:30, and a webinar on Wednesday December 6, 12-1:30.Â Â Click here for more information about meetings around the state, and click here to send comments. The State Rail Plan sees the value of increased capacity on the Caltrain corridor where the most popular trains are overcrowded. The State Rail Plan supports plans for full electrification, longer trains, and level boarding, to carry more passengers more quickly and reliably. Â Â The State Rail Plan is clear that dates in its roadmap are coarse-grained time windows not specific delivery dates. That said, the Caltrain Modernization 2.0 improvements are listed in the plan as just getting started by 2027 and being complete by 2040. That is a long time from now. Given growth on the corridor, we will need funding and momentum to get the increased capacity sooner. The State Rail Plan envisions grade separations, not only as stand-alone safety and traffic relieve projects, but as families of projects to pursue systematically on key corridors. â€œWhen organized and pursued strategically as part of an identified corridor, grade-separation projects can dramatically improve rail capacity and passenger service.â€ The Caltrain corridor is identified as needing full grade separation; this strategy could help fund the program and potentially help improve the cost-effectiveness of designs. The State Rail Plan calls for along with systemwide electrification, which reduces the cost of operations and maintenance, and life cycle analysis to be considered in the timing of fleet upgrades, including the cost of maintenance. By 2040, Caltrans expects a majority of passenger miles on the rail system to be provided by electric trains, with Caltrain electrification considered a priority project. These principles could help accelerate Caltrain full electrification in the near future, facilitating lower operating costs and better schedules. The mandate for a â€œpulseâ€ schedule could be beneficial to ensure that the blended system with High Speed Rail is helpful and not harmful to Caltrain service. The mandate requires services that feed key long distance routes to connect and enable timely transfers. Without good design of passing infrastructure, a blended system with High Speed Rail could result in an irregular schedule local trains. But that wouldnâ€™t allow Caltrain trains to be pulse feeders for high speed long-distance trains. Â A pulse mandate could help ensure a quality Caltrain schedule with the blended system. The pulse schedule is designed to connect “hub” station areas, at major urban centers, and places evolving as walkable communities. Transbay is included as a major hub, with the Downtown Extension connecting the tracks to downtown San Francisco. A classic strategy to increase ridership on a rail line originally built for commuter service is connecting the line to the core city downtown; there are 3 times as many jobs within walking distance of the Transbay station as the rest of the Caltrain line combined. Â The Downtown Extension project is a key part of the State Rail Plan; the report timeline envisions construction having started by 2022 and being complete by 2027. The plan envisions even more capacity and more ridership by pursuing the strategy of extending regional lines through the center of core cities, instead of stopping at a terminal station, which forces all trains to share the limited track access into and out of the station. Historically â€œcommuter railâ€ systems were often designed with stub-end terminals. Around the world, over the last 50-60 years, major metros have modernized their systems, running the regional system through town, much higher capacity and ridership. 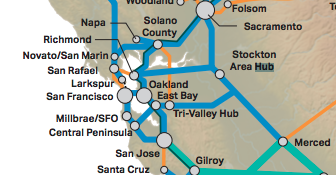 The State Rail Plan calls for a second transbay tube including conventional rail, connecting from Transbay through a hub in Oakland via electrified service out to Sacramento. The plan envisions that major investment of a second transbay tube could be justified by the combined benefits of local congestion, access to regional markets, and long-distance service (4.10.2). The State Rail Plan sets goals for using assets more efficiently following international best practices, and investing more efficiently by avoiding redundant projects. One of the challenges in planning for service at the Transbay and Diridon hubs with Caltrain and High Speed Rail has been expectations for relatively long turnaround times and coordination challenges, leading to proposals for lower service levels. The State Rail Plan promises to set and enforce standards using global best practices, resulting in higher capacity at hub stations. The State Rail Plan envisions the Dumbarton Corridor as a logical link in the statewide network. Â The plan envisions integrated express bus connections by 2022, and bus or rail connections over time, coordinated with the stateâ€™s pulse system. Â Integration with the State Rail Plan could help make Dumbarton corridor transit better for riders and more cost-effective. One of the major barriers to good passenger rail service is that major freight railroads own much of the right of way. Â The report identifies key bottlenecks and goals to use money and leverage of the state to reduce conflicts between freight and passenger rail. 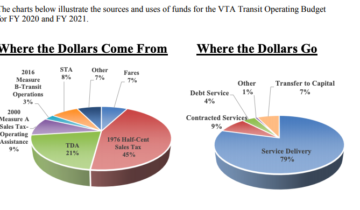 SamTransâ€™ recent Dumbarton study assumes that will be difficult for ACE and Capitol Corridor, running on freight tracks, to achieve timed connections, and therefore it does not have robust forecasts for these connections. The difficulty of making tight connections also plays into the SamTrans recommendation to run bus service parallel to rail. The vision of a pulse system connected at hubs leads the plan toÂ envision an East Bay hub station near Newark, Hayward, or Fremont to allow connections across Dumbarton to the Peninsula, to north-south service between Oakland and San Jose, to east-west services between Stockton and San Jose,Â and to BART.Â With this vision, the Plan clear sees need forÂ a hub station to improve multiple connections, unlike the “blind men and elephant” fragmented view of connections found in various studies from BART, SamTrans, ACE and Capital Corridor. Considering the Dumbarton connection as part of the pulse system, fixing freight bottlenecks to allow timely passenger connections, and creating an East Bay hub with connections North, East, West, and BART, could provide much more convenient service for riders. The Peninsula Corridor is fortunate that far-sighted leaders in the 90s purchased the Caltrain right of way, but freight still has rights to use the corridor, and conditions imposed by freight add challenges toÂ improving passenger service. There may be additional opportunities to leverage the principles of the State Rail Plan to addressÂ otherÂ challenges presented by freight on the Caltrain corridor, such as a 1% grade preference and the opportunity to reduce vertical height preferences from 22â€™ to 19â€™, that could improve designs and lower capital costs for corridor grade separations. The State Rail Plan envisions a system of coordinated fares and integrated ticketing options across service providers, with a demonstration in place by 2022, and a full system operating by 2027. Â This is a compelling vision that other parts of the world already achieve. However, California and the Bay Area in particular are notoriously fragmented. Â At the first public meeting in Oakland, State Rail Plan staff said that they envisioned local operators continuing to be in charge of fares. Given this, we are puzzled as to how an integrated statewide system can be successful. The State Rail Plan includes an innovative concept for corridorwide transportation demand management programs. Such a program could set ridership and mode share goals for a corridor, and reward/require effective practices including paid parking, guaranteed ride home, transit passes, carpool programs, and other services, democratizing the successful programs run by the largest corporations. As with fare integration, we are wondering about the institutional arrangements that need to be put in place to provide an unprecedented level of coordination. The data assembled in the State Rail plan reveals something that Bay Area transit watchers know intuitively – Caltrain is in a different league than other services classified as â€œcommuter rail.â€ Â Excluding Gilroy service, Caltrain generates more than ten times the number of passengers per route-mile than other services classified as commuter-rail. Â Â For further comparison, Caltrain generates about a third of the passengers per mile as BART, though Caltrain currently offers less frequent service. The State Rail Plan supports critical concepts that will enable Caltrain service to break out of the â€œcommuter railâ€ box, following the example of systems around the world: integrated fares and scheduling, a downtown connection with eventual through-running for much greater capacity, electrification, better asset utilization with shorter turnaround times and more service for higher ridership. The State Rail Plan doesnâ€™t give a name to the â€œregional metroâ€ service pattern that is used so successfully in other parts of the world, where services such as German S-Bahn and French RER provide frequent, all-day service as an integrated part of metropolitan area transit. Â Having a â€œregional metroâ€ overlay concept might help the State Rail Plan identify additional ways to increase ridership and value from more urban segments of the State Rail network, and would help justify and fund these improvements for Caltrain. Looking at the whole pattern, a network of elevated bidirectional group rapid transit could eliminate freight conflicts, bypass or go above choke-points, offer close headways for high system capacity, and provide long-distance as well as short-haul service, with ample power coming from a canopy of solar panels above the guideways. All this for a fraction of the life-cycle system costs of heavy rail or bus rapid transit. I take it that “Group Rapid Transit” is the new buzzword of the PRT pod people? How strange. I do agree that PRT could be build for “a fraction of the cost” of heavy rail. It’s just that the fraction is about 10/1, not the fraction that the pod people imagine. Great post! Thank you for breaking down the (rather lengthy) 2018 state rail plan. Highlights for me are the planned grade separations (kudos to San Mateo for being a leader on this! ), run-through tracks to Oakland and Sacramento through a second transbay tube, and repositioning Caltrain as a ‘regional metrro’ service. If L.A. Metro can expand public transit as much as they have, why is it so difficult here in the ‘progressive’ Bay Area? It’s time to sideline the NIMBYs and get going!! !